"Anybody can run the first 6-9 miles of a marathon at a fast pace. 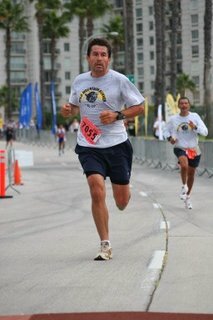 The secret is to run the last 6-9 miles of the marathon at that same fast pace. Control and discipline are the essentials of marathon success". As Emperor Julius Cesar would comment when he attained victory over his enemy, the Wild Mountain Runners can borrow his phrase, Veni, Vidi, Vinci I came, I saw, I conquered! 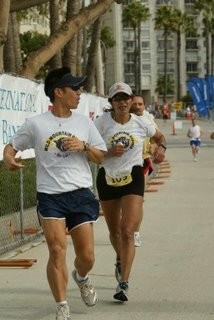 That is what scores of Wild Mountain Runners did, some running with the Gato colors for the first time at the Long Beach Marathon and half marathon October 15, 2006. 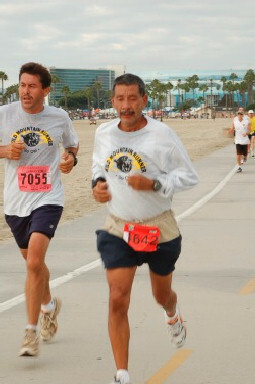 In the half, Maurilio Amezcua led the 55-59 by placing first in his age division with a time of 1:26:22. Maurilios running talent mixed with hard training certainly paid off. 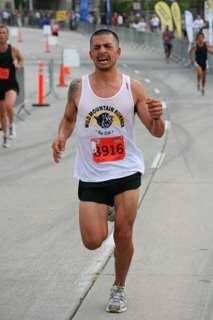 Second in that same division was Elias Garcia with a time of 1:28:44. 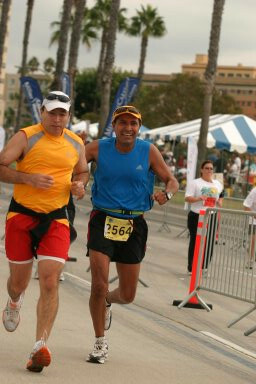 Not to be left by the South Gate Gatos, Roberto *Kadafi* Perez and Felipe *Felipao* Reynoso, each came in 4th and 5th respectively, with a time of 1:38:15 and 1:39:35. Gregorio Rodriguez, a new Gato, came in 3rd in the 45-49 division with a time of 1:25:35. 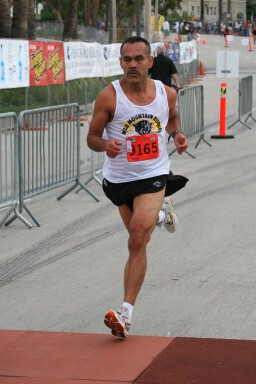 In the marathon, South Gate Gato Salvador Ponce took 4th place in the 40-44 division with a fantastic time of 3:10:46. 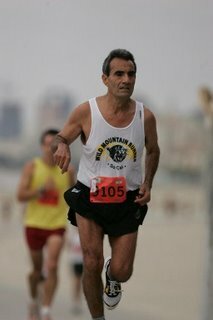 Long time member and now coaching some of the South Gate runners, Paco Licea provided me with a list of other Gatos who ran. However, with some of them, I did not get the time or place: Carlos Gadamez, 40-44, 1st place. Rigoberto Contreras, 40-44 came in 11th in his age division. 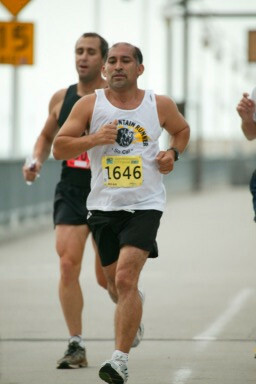 Marco Tiscareno (no age given) came in with a time of 1:25. 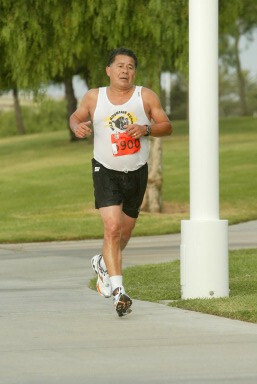 Jose Luis Loera, in the 40-44 age division did a 1:39. To all Gatos , congratulations. ... for their not so small accomplishments. Both qualified for Boston 2007 ! You can reserve your WMR uniform by contacting Julio Jaramillo who implemented the uniform project. ORDERING: Orders may be made by contacting Julio Jaramillo. You can catch him at the Park during Sundays. Uniforms are on a first come first serve basis. Racing singlets are limited and available only for new members. Note: You must be a WMR member. Not yet a member? Simple pass or fail written examination and a physical agility test is required to become a member. Sample questions below. A. What is Kadafi's real name? B. Which part of Tetrick Trail is called "Sombrero"? 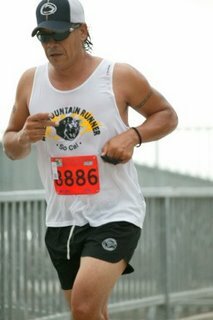 C. Who is the Founder of Wildmountain Running Club? D. What is the clubs favorite beverage? F. Who is the one and only barefoot runner in the club? 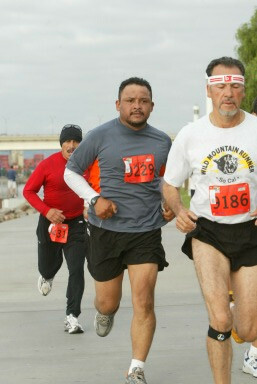 G. Name atleast 2 wildmountain runners that did'nt make it at the 2004 Las Vegas half marathon starting line and why? You may submit your answers on the links comments below.